Keeping your attitude positive is just plain a good idea, no matter what. How to do it...well, that's another story. And that's the story you're going to find right here. You're going to get some great tips on how to make it through difficulties faster and easier, and how to stretch those good times out as far as you possibly can. 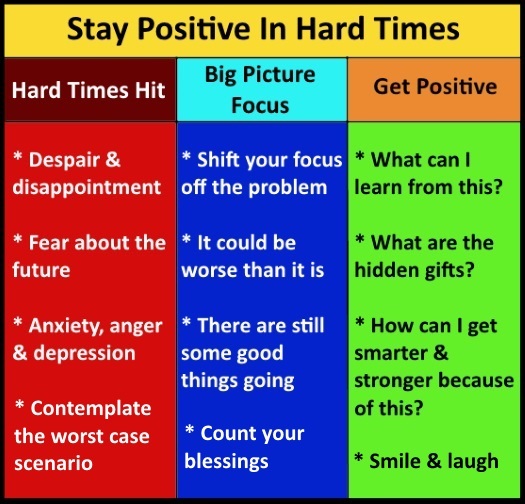 We'll start with the hard part...staying positive when things are bad. Why have a positive attitude when things go wrong? Isn't it normal to get a negative attitude when something bad happens? Yes, it is normal...but you want to move through those negative feelings as quickly as possible. When the unhappy situation comes up, if you let yourself go totally negative about it, you'll only make a bad situation worse -- and you're way too smart to do that. Now we'll go through each of these steps, to help you understand exactly how to do this. It' not necessarily easy...but it's a whole lot easier than just letting the circumstances of your life rule how you feel. Life can be very hard sometimes, we all know that. What sets us apart is not whether we have hard times or not...it's in how we deal with them when they happen. The first reaction is often shock, especially if you're taken completely off guard. This is followed by a let down feeling of some kind. This is natural and unavoidable, and is nothing to be ashamed of. You just want to keep moving and not stay stuck in these emotions. One of the things that make hard times so difficult is the natural fear that comes. Pain automatically triggers some fear, even if it's deeply subconscious. It might be fear that you'll never feel good again, that love is gone from your life, that you are vulnerable and will never be safe, or that your health will decline and there is nothing you can do about it. These are just fears, not facts. If you're not able to move on from the fears that arise, you may find yourself stuck in anxiety or depression, or both. Anger is also natural in many cases, but it's not always present for everyone. And unresolved anger turns into bitterness and cynicism which can harm your health. You have to keep moving to prevent these negative emotions from taking over. When you're upset about something, your focus narrows and concentrates on that problem in hopes of figuring it out and determining how bad it is. This is instinctive, and has survival value, but it's not a place to get stuck. You start to feel some relief as soon as you expand your field of focus off the problem and onto the bigger picture of what's going on. You start to realize that it could be worse than it is, which means you're opening your mind to the not-so-bad and more positive aspects of your situation. Next...and you will have to make some effort here, you start to see the good things that are still going on, and some of the resources you may have for problem solving to make your hard times better. Keep your attitude positive during hard times by always looking around you to what is still good, right and working. "It's not what happens to you, it's how you respond to what happens to you that determines your level of joy and success in life." You ask yourself, "What can I learn from this?" This includes taking responsibility for what has happened, in any way you can, with the question, "What, if anything, did I do to contribute to this?" You begin using your imagination to find and focus on the hidden gifts within your problem. They may be totally hidden at first, especially if you're still feeling shock and disappointment. Keep looking, and you'll find the gifts. You start asking yourself the all-important question, "How can I get smarter and stronger from this?" You make up your mind that you're going to keep your attitude positive and come through your situation with strength and wisdom you may not otherwise have gained. I know you may think this is "too good to be true," but I want you to consider that nothing is too good to be true. Take the ceiling off of the joy you imagine for yourself, and apply these tools, and you will find more and more good coming your way. And when good times come, you want to welcome and receive them gratefully, and do nothing to block or interfere with more and more coming along. I think you're getting the idea here. Far too often, we have a tendency to downplay good things, for fear of bragging, or...some even think if you're too happy, you'll "jinx" it. Not true. Practice these methods, and you'll invite more and more good into your life. Pay attention to what you say to yourself and others when good things happen. Far too often, people will say, "I can't believe it!" or "No way!" in response to really good things they didn't expect. To keep your attitude positive about the good times, I recommend you say to yourself, "Yes! More of this, please! Keep it coming!" Quietly, in your own mind and heart, say "Thank you." You may be thanking yourself, or God, or somebody else who was involved. The main thing is that you're being grateful. Don't underestimate the power of the word, "Yes!" Say it over and over to yourself, while welcoming the good into your heart and mind and your life in general. Pay very close attention to the positive feelings you're having. Excitement, thrill, happiness, and joy are extremely beneficial to you. Notice every aspect of your positive emotions, breathe deeply into them and say to yourself, "Yes. This is me. I welcome this good feeling. This is who I am." Write in your journal about why you like this good thing that has happened. You might want to keep a separate journal for this. The process of writing anchors the emotions and thoughts into your experience, and actually grows the value that it holds for you. Tell only people who will celebrate your good fortune with you. This is very important. If you don't know anyone who will give you unconditional support and happiness for what has happened, do not share it with anyone. Keep your attitude positive by creating upbeat, supportive friendships. Keep a calendar or some kind of chronicle of your favorite memories and positive experiences. Combine photos with your notes to further strengthen the emotional memory, or just create a photo album focused on what you want to remember. Periodically review these notes and photos, to keep the memories fresh and alive. 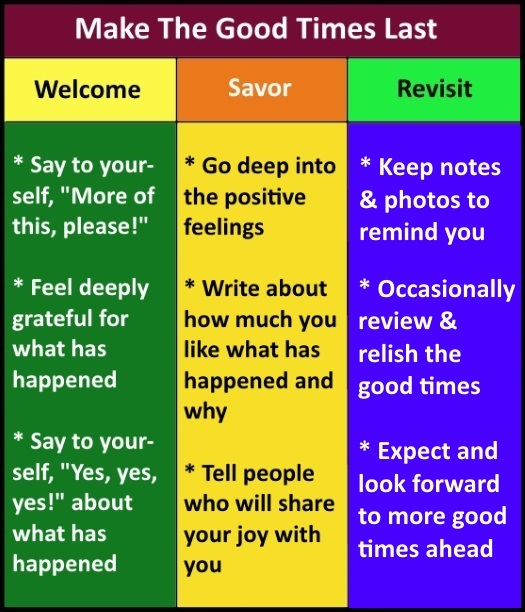 These past experiences of joy and well being are great resources for keeping your attitude positive. They are like treasure troves just waiting for you to mine them. Think and journal about your positive expectations that more good is coming. Take the ceiling off of the joy you allow yourself in your imagination. Picture and imagine a future that is beyond anything you've ever dreamed of or hoped for. Stay optimistic no matter what! That about wraps it up for your plan of how to keep your attitude positive no matter what happens. Thanks for stopping by, and happy Goodfinding!